I haven’t talked much about moving since my announcement last month ( Coming Full Circle ) but Operation Moving Home is never far from my thoughts. Part of me is happy that we’re taking things slow and I’m not rushing around like a mad woman like last time. But another part of me longs to move things along a little more quickly. Yesterday I actually found myself contemplating if I should put the clean towels away in the linen closet or if I could get away with packing them away in the box that was, oh so teasingly, sitting right there. The towels are safely in the linen closet and instead I turned that desire to move things along into a couple of moving printables that I can put into my Moving Binder when I start making one. I kind of skipped ahead a few (or many) steps on my to-do list when I made these ones. 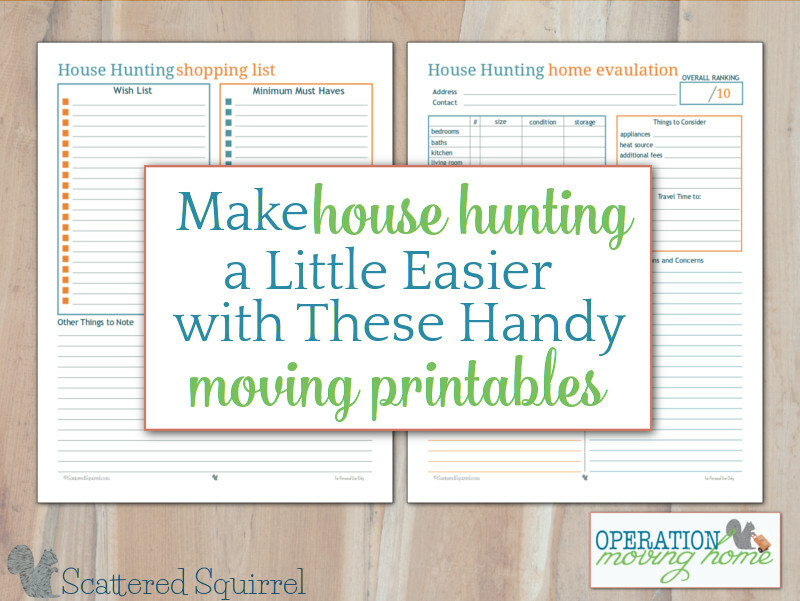 We’re nowhere near being ready for them, (despite the fact that we both check the housing market back home on a weekly basis lol) but when we are ready to begin house hunting these printables are going to make that job a little bit easier. House hunting can be tough, and to be perfectly honest, it’s not high up on my favourite parts of moving list. (Yes I have a list for that.) As renters the pressure to pick just the right home isn’t as high as it would be if we were buying, but we still try to take care in our selection. The last thing we want to do is have to turn around and move again right after unpacking. 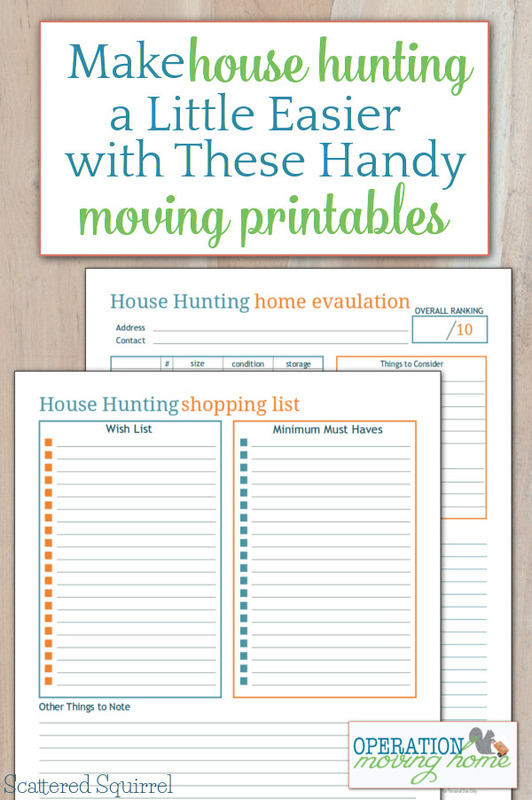 Whether you’re buying or renting, these handy moving printables should help make your house hunt a little bit easier. Just because we’re not ready to start packing, doesn’t mean we haven’t been spending a fair amount of time on our plans, and part of that is figuring out what we need in our next home. I am a bit of dreamer, so I know that I need to have a list of practical must haves that I can use to focus my search, but I also like to keep a wish list of sorts close by too. Sometimes there are things you’re will to trade off for something else. Such as, converting one giant room into two bedrooms, or creating a home office in the kitchen. Having all those things written down in one place can make house hunting a little easier. Doesn’t check all my must haves, it’s not a home for us. So with that in mind I whipped a simple House Hunting Shopping List printable. I’m sure you could list a hundred other things you might add, but you get the point. Using this moving printable gets all those items out of your head and into one place. The nice part is, you and spouse can fill this out together so that you both know you’re on the same page. Or maybe you’re having trouble agreeing? It happens. You could each fill one out and compare them and look for compromises. If you work with a list of what you need and want you’ll be able to really zero in your search on homes that will suit you. Then you can use the next printable to help you compare the possibilities. storage – because storage is important. Are the closets in the bedrooms a good size? Do the bathrooms have adequate storage? Is the kitchen low on cupboard space? Beside that is a space to keep track of the extra stuff, such as are appliance included and what additional fees are there? Is there a strata or some weird HOA dues you need to pay? I also included a spot to jot down travel times to frequent destinations like work, school and shopping. While not totally importantly, these little details could help set one home over another. And finally room to jot down thought and impressions, so that you have them later to reference, and more importantly room to note any questions or concerns you would like to discuss with the seller or landlord. That way you won’t forget. Once you’re all done taking a look at the home give it a rating out of 10 for whether or not it fits what you’re looking for. House hunting is only one small part of the moving process, but it’s a rather important part. Spending a little time thinking about what you need and want in your next home is a must for anyone moving. If you’re in the process of moving, or will be moving in the future hopefully you find these helpful and I wish you all the best in your move. 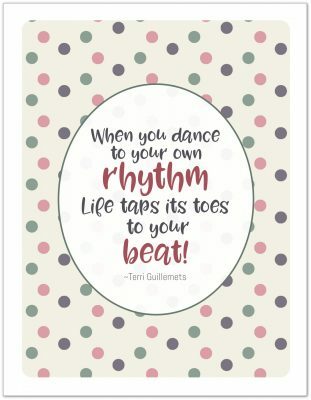 I can’t wait to start sharing a few more moving printables around here. Stay tuned, because more will be on the way. Now, I’m going to go fill out my copy of the first and day-dream a little about when I get to start using the second. Are you planning a move? 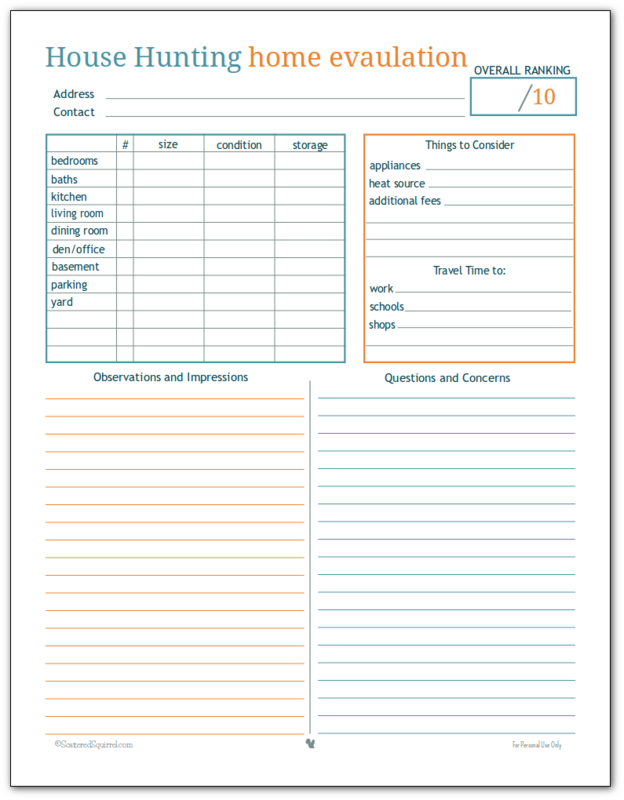 What other sort of printables do you think would be helpful to have when moving? Travel time to places is oh so important! It’s one thing to say “I’m going to live in x-city”, but cities are so big…if you live on one side, does it add half an hour to your commute? Is the grocery store on the other side of town, and are you the type that often has to pop in for a gallon of milk or something…that could require you to entirely redo how you do your shopping. As well as additional fees – in our apartment hunt, one thing we had to remember to ask was if water/sewer costs were covered or not. A lot of places do not pay for these things any more, and most ads online do not mention anything in regards to that (why advertise that it’s going to cost even more to live somewhere?). Travel time is really important, especially if you’re a single vehicle family like we are. I wish I had thought about that more when we moved into our current home. Though the boy’s schools are in walking distance, and since that’s an almost every day journey for us, that sort of trumps the walking distance to the grocery store. Yes, those additional fees can add up in a hurry. We pay extra for garbage/sewer/water, but our landlord was upfront about it when we came to look at the place. He hadn’t even had a chance to do more than put a sign in the yard, so we didn’t have any details when we came to look at the place. On the other hand, we’ve been here for three years almost and they’ve never raised our rent, so I won’t complain about those additional fees. Great tips. Moving is something that I have always dreaded. I know it is exciting when you are moving closer to family but the whole moving part is what I don’t like. Your moving printables are wonderful because they help you make sure you won’t forget any of the important details when house hunting. Moving can be very tedious, the destination or reason for the move makes a huge difference in how much I dread it or look forward to it. I noticed during our last move that I was scribbling notes here and there as we were house hunting and I wished I had taken time to organize them a little better so that making comparisons were easier. Hopefully, this time around it will be a little less scattered. These are just perfect! We bought a new house last year and it’s so hard to keep up with everything you see and like. This is a great memory jogger! Thanks! LOVE these! When we were searching I had a notebook and kept getting very confused about which property had what – this would have helped me out no end! What a great idea! I love these! Thank you so much for sharing, this is going to be such a huge help in keeping my head noise at a low during this move. I’m happy to hear that the printables might be a help to you Bella. Moving can be a crazy stressful time! I wish you all the best in your move. I get easily distracted, forget why I’m holding something, what I’m saying in mid-sentence, what I went to the store for – and so you can only imagine what moving is like! Your printouts are awesome!! I love lists and am forever making up multiple notes on smaller notebooks so that I don’t forget things and so I love the idea of having a binder to keep all of my relevant moving information together. I am a bit of a control person/perfectionist when it comes to my things. Some mild OCD. For example, my spices are in Tupperware and in alphabetical order, when we were first married, my husband would turn one backwards just to see how long it would take me to notice. You get the picture. So moving, my anxiety hits a 10: My illusion of control quickly breaks and I find it hard to think in all the mess. Your binder has been my constant companion. I just keep checking back – even the same pages over and over. It just helps keep me on track that I haven’t missed anything. You really have thought of everything. I have all the information I need right at my fingertips. 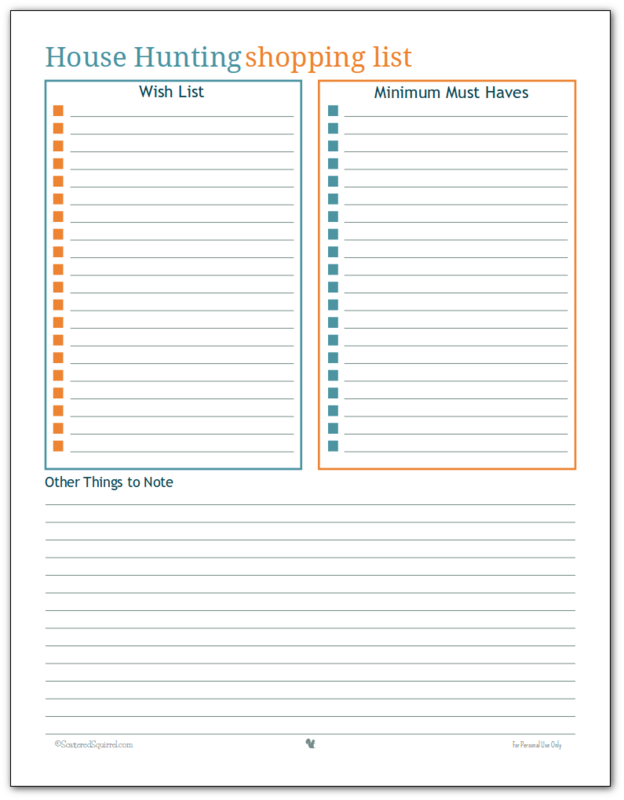 Like I said before, I love lists – this gives me plenty and all at the right time. Right now I am going to look at some houses and I just love the layout of that sheet. I didn’t like the others I saw anywhere else. And, thanks to your wonderful binder and thoughtful pages I won’t have to stress too much before during or after because you put so much thought behind every stage. Hi Tracy, I completely understand where you are coming from. Moving can be so stressful at the best of times, but for those of us who feel scattered it can be so overwhelming. I’m so happy that you’re finding the moving printables helpful and that they’re helping bring a little bit of a peace of mind to your move. They really helped us during our last move – especially after the accident. Knowing I had all the information on hand took a load of stress off me. I wish you all the best with your move!